This is our custom-built Ground Lift Cable. To eliminate ground loops and noise you sometimes need to detach (Lift) the ground on one end of a cable. This cable is built with the ground lifted on one end to break ground loops and connected on the other end to maintain shield connection to ground. This is a good first step to eliminate noise but not a guaranteed solution. Construction is Neutrik connectors with Mogami 2552 cable. Neutrik connectors are some of the best connectors around. 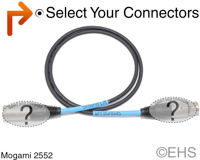 Mogami 2552 is a balanced "microphone cable" style cable and is very flexible, durable, light-weight cable. Photo 1 shows 3' cable with XLR male and XLR female. Photo 2 shows one option for the two ends with XLR male and XLR female and standard blue label.